Multipurpose is always something that is appreciated. And that is what we have found in the InnoGear Upgraded Solar Lights. These guys have a 4.1 star rating on Amazon.com with positive reviews making up more than 60% of the 3,087 reviews. So let's check out what makes these lights so great. While we usually start with the relative size of the devices, it is important to mention the biggest selling point of these lights first off. The InnoGear Upgraded solar lights are a 2-in-1. Meaning they can either be pathway lights, or spotlights. They have a attachable spike that allows them to be planted in the ground along side a set path, but that spike can be taken off for the lights to be mounted on a wall. The package includes screws with anchors for the lights to be placed on the outside of your house. That being said, the lights are a good size to allow for the 2-in-1 feature. They size at 7.1 x 7 x 9 inches and weigh a little over a pound, 1.7 to be exact. So you will not have to worry about the screws not being strong enough to hold in the lights to the wall, as they are fairly light. The body of the lights is made from high strength ABS plastic. It has a waterproof rating of IP65, so you will not have to worry about the lights getting damaged from rain or snow. They are also heatproof, for those hot summer days where your lights will be sitting outside getting all toasty. No harm will come to the solar panel, battery, light, or other circuitry due to water or heat. The InnoGear Upgraded solar lights feature 4 LED lights in each fixture that output 50 lumens each. The combined brightness equals to 200 lumens, which is incredibly bright. This makes them give a great amount of light, perfect for lighting a path or above a doorway. In addition, the fixtures include a 18650 lithium battery (2200mAh). This is awesome and means that you will be able to have access to constant light for nearly the entire night. On the highest mode of brightness, these lights will last you between 4 and 6 hours, given the previous day was nice and sunny. On their low setting, they should last you between 8 and 12 hours, which well more than you need. Speaking about the battery, since these are solar lights, there is no need to plug them in anywhere. They are able to recharge themselves throughout the day. The solar panel on the InnoGear Upgraded solar lights gives 5.5V 1.5W, which is a good conversion for such a small fixture. Of course, they are sensitive to the weather and overcast or rainy days can affect their performance. These lights have a lot of cool and convenient features. For one, their light is automatic. As soon as the sun goes down, the lights come on. So there is no need for you to switch them on or anything. In addition, there are also two brightness modes for the lights, depending on your needs. You can have them at full brightness all throughout the night, or have them at a lower light setting for the whole night. Unfortunately, there is no motion sensor which can activate the bright light when needed. You either have to deal with full brightness, or low brightness. Nevertheless, the different modes is a nice touch. The lights also feature a frosted solar panel, so there is no need any additional film to protect the solar cell. Also, the panel can be adjusted to just the right angle to absorb the most amount of sun throughout the day. The InnoGear Upgraded Solar Lights are justly named. They are very much upgraded from their previous model, which many consumers had problems with. So they completely revamped the design and fixed a lot of the common issues people complained about. For one, the upgraded model has a larger solar panel which allows for more sunlight absorption, meaning longer active time. They also upgraded the LED lumen output from only 80 to 200, which is a huge difference. Other changes include an anti-rotation design for their ground spike option, as well as a longer spike. Overall, these upgrades seem like they were much needed, and are well received by the consumers. InnoGear is a technology company that specializes in solar lights, outdoor and indoor electronics, and aroma therapy gear such as diffusers, vaporizers, oil burners, and other products. They are also a major manufacturer of health care and electronic accessories. The InnoGear electronic accessories line offers wireless communication technology in applications, such as bluetooth selfie sticks, bluetooth selfie shutter, wireless pagers, and more. Their mission is to "lead the LED lighting revolution and make energy wasting traditional lighting technologies obsolete through the use of energy-efficient, environmentally friendly LED lighting." In fact, now they are a market-leading innovator in Diffusers and LED lighting, so they are living up to their mission. The 2-in-1 function is awesome. Allows for a wide range of placement. If you want to use them as pathway lights, go for it. If you need them above a doorway, you can do that too. Plus, both installations are very easy. Either stick it in the ground, you screw it into the wall. The 200 combined lumen output is very bright. Allows for plenty of light, wherever you need it. Plus the dual brightness settings is a nice touch. The battery is actually pretty big. the 2200mAh battery allows for the fixture to last between 4-6 hours on full brightness, which is all you need for the night. If it is on its low brightness setting, it can easily last between 8 and 12 hours. The InnoGear Upgraded solar lights have a waterproof rating of IP65 and are totally weatherproof. In addition, they are also heatproof, so you do not need to worry about leaving them out in the summer heat. And of course, an adjustable solar panel is always nice to have. Allows for optimal solar absorption throughout the day. Just move it to the best angle to get the sun throughout the whole day. There is no motion sensor, so you are either stuck with low brightness all night, or full brightness. Though, each is best for its different functions. Low brightness works better for accenting a pathway, while full brightness works for a wall mounted spotlight. Solar panels are sensitive to overcast days. If it is a cloudy day, they will not lat as long during the night. 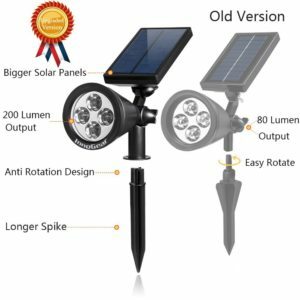 The the lack of a motion sensor makes for having to deal with dim light or very bright light, these are still very good quality outdoor solar lights. The fact that they can act as either a pathway light or a wall mounted spotlight is awesome. Also, you end up getting two of these lights, so you have double the possibilities. While they wouldn't make good security lights, they work great as lighting up a garden, pathway, or above a door. The Innogear Upgraded Solar Lights are great quality lights. Whether you need them for spotlights or pathway lights, they have got you covered. Plus, with the added features, weather protection and big battery, they can handle anything that comes their way. Except maybe an overcast sky, they may have some performance issues there. Nonetheless, these lights are great quality. Right now, you can grab them for just $23.99, and that price includes two of the fixtures. So that's pretty cool. If you want to read up on any of the other reviews of our best outdoor solar lights, check out the rest of Green and Growing. Here are some top questions that I found for people seriously considering buying the InnoGear Upgraded Solar Lights. What kind of light to these produce? There are two color light options, warm white or white. You can choose when you visit their Amazon page. Will the light pivot when in the ground? No, the spike and insert slot have an anti-rotating feature. Are the batteries included with the lights? Yes, the batteries come with the package.